0 Comments Published by Jane on Tuesday, September 30, 2008 at 9:32 PM. I recently received a request for some old McDonough wedding photos. 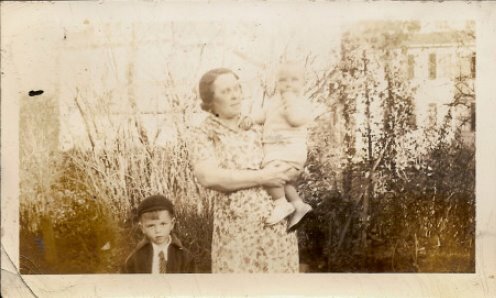 In particular, Rae Patria is seeking the wedding photo of his grandmother, Sara "Sadie" McDonough Ahern. If you have old wedding photos that you can share please let me know. Also, if you have old photos which appear to be from around 1900 - 1920 which could contain some of the McDonough women, I am very interested in them as well. 0 Comments Published by Jane on Thursday, September 25, 2008 at 8:05 PM. Perhaps it is the changing season, but I have been on a bit of reading binge lately. I have just started the new Dennis Lehane novel The Given Day . I picked it up since it looks like an entertaining read, but more importantly it is set in 1918-1919 Boston and the characters experience important local history that impacted my ancestors. 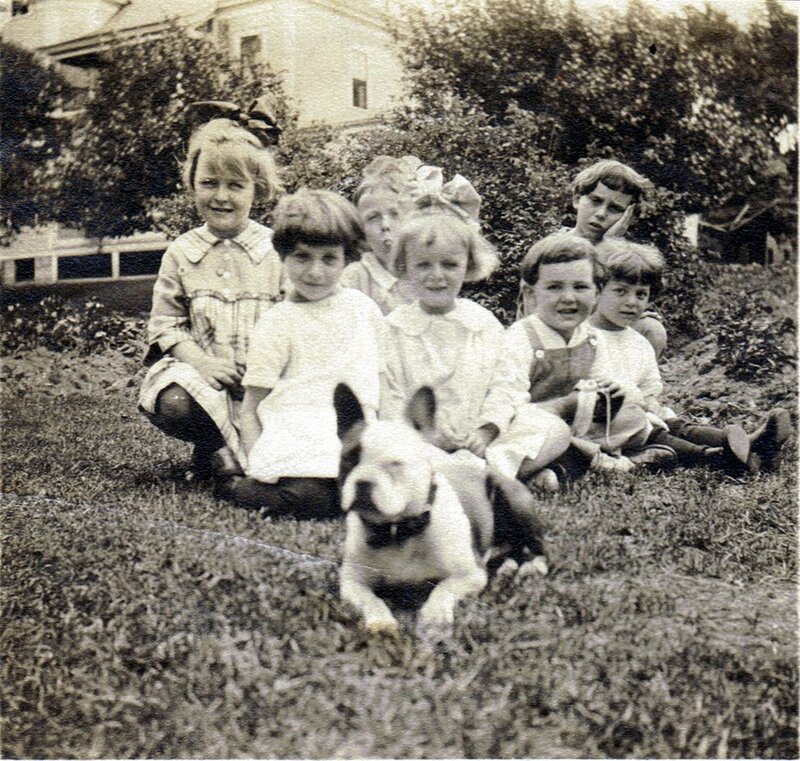 For example, the Influenza epidemic that my Great-Aunt Jane Sullivan experienced first hand. The 1919 Police strike which left its mark on my Great-Grandfather, Maurice Sullivan. Even Babe Ruth and the 1917 and 1918 Red Sox are in the book. Soon enough I will get back to my more formal family research. 0 Comments Published by Jane on Wednesday, September 24, 2008 at 11:21 PM. Their rockbound soil offers no opportunity of development. New industries are required to relieve the situation for all time." This silent British news reel is from about 1915 and shows potato farmers in Connemara Ireland. As you watch the film, notice how the farmers are transporting their crop. The shots of the countryside show a rather bleak landscape full of rutted roads and very rocky soil. It also appears to be rather wet and cold. Toward the end of the film you see a small farm family. The women are wearing colorful shawls - not coats. The last shots seem to show some sort of work relief program. The farmers appear to be building a road with their bare hands using the abundant rocks. 0 Comments Published by Jane on at 11:03 PM. 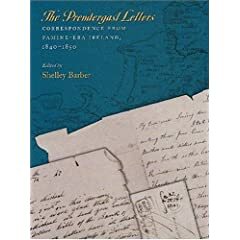 I recently finished reading The Prendergast Letters: Correspondence from Famine-era Ireland, 1840-1850 which I found very interesting. 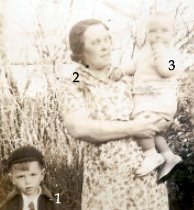 The Prendergast family lived in Milltown Ireland, just six miles from Firies where the Deedy (Deady) and Donovan families originated. 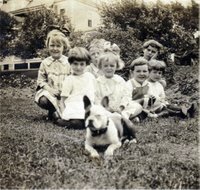 Some of the Prendergast children immigrated to Boston and the letters provide some insight into what life in Ireland must have been like for my ancestors. If you are interested in reading some first source material about this era, this book is well worth reading. 0 Comments Published by Jane on Thursday, September 18, 2008 at 9:08 PM. Flipping through the old Sullivan scrapbooks, I came across this interesting little article about my great-uncle, Capt. Lawrence T. Sullivan. While the article provides some nice insights into his personality, it is riddled with small errors. I will list the corrections to the errors below, but first, here is the text of the article (source and date unknown). In terse, documentary language, the official government records state that Capt. Lawrence J. Sullivan was "lost at sea" when his collier was torpedoed in the Atlantic on March 14, 1942. He was, the records state further, 43 years old. But ask any resident of St. Andrew rd., East Boston, where in a house numbered 69, Larry Sullivan lived, and you'll learn that he is still 43 years old. The neighbors insist on the present tense, so far as they are concerned, Capt. Larry will live forever in their memories. Larry met death just as he had lived, courageously, without any trace of fear. That, too, is in the record. The older resident of St. Andrews rd., remember him as a nautical school student during the last war. They watched him grow from a grammar school kid into manhood. They remember how, at 25, he became a sea captain, the youngest captain, incidentally, on the Atlantic coast. His mother, Mrs. Susan Sullivan, is a widow. 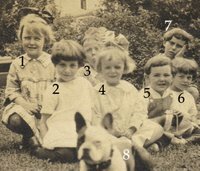 Larry was one of eight children. One brother, Daniel M. Sullivan, is head of the Boston Water Department. Another, William, is in the School Department. His mother fondly recalls that Larry's earliest love was a small sailboat. To get that boat he worked and scrimped and saved while he was in his teens. Mrs. Katherine Corrigan, the Sullivans' next door neighbor, remembers most his dry, salty humor. She pictures him today, as she so often saw him. "When he was home he was always puttering around the house, or in the yard, fixing my fence or garden or working on his own," Mrs. Corrigan said. Capt. 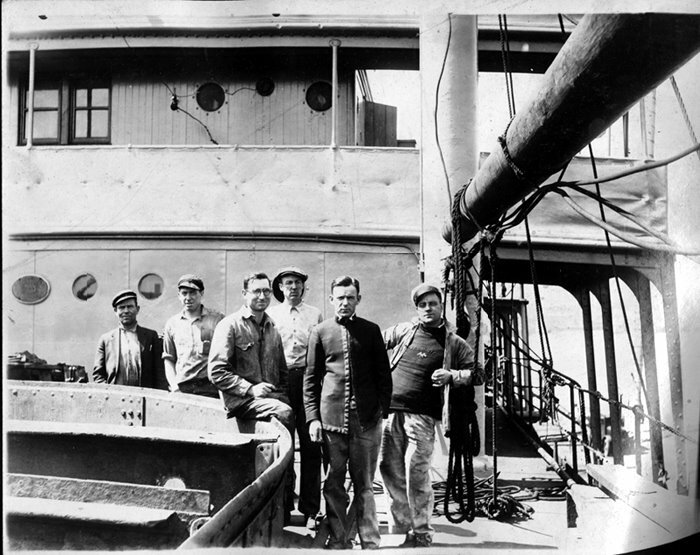 Sullivan came from a seafaring family. His mother says his uncle, Patrick Henry Sullivan, was lost when a frigate sank off England in 1863. At sea, Capt. Sullivan took part in many rescues and once the ship he was commanding saved all members of the Three Sisters, when that vessel foundered at sea. "You couldn't help but like Capt. Larry," said Mrs. Corrigan. And all friends and neighbors of the Sullivans readily echo her sentiment. Corrections: His middle initial is T. not J.; the house number was 59, not 69; One of nine children, not eight; P.H. Sullivan was lost at sea in 1888 off the coast of Waterford, Ireland - not England in 1863. Another way to gain a bit of insight into Capt. Larry's life is to look at photos found in the old scrapbook. While the one used in the article is a handsome head shot, this other one I found shows him on board one of his ships alongside his crew. Lawrence T. Sullivan is the one in the black buttoned up coat. The photo is not labeled and I don't know the names of the other men. If you look closely (click on image to see larger) you will see that Capt. Larry is holding a cigarette in his hand - so he was a smoker. Also, you will see that his jacket appears to be covering up his dirty work clothes. While he may have been a captain, he was not one to just hang out in the wheel house - he appears to be crawling around and getting dirty alongside his men. Another thing to note, is Capt. 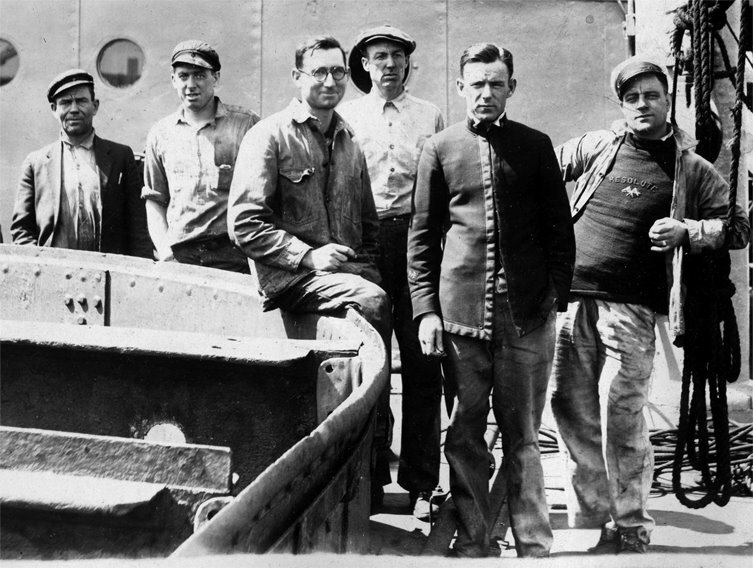 Sullivan's face in the ship photo. While still a handsome man, you can see the weathering from so many years at sea. Something not seen in the newspaper article. Seeing him in the ships photo, you can imagine him as the salty talking, yet kind and hard working man his neighbor remembers in the article. 4 Comments Published by Jane on Wednesday, September 17, 2008 at 12:43 AM. On the cover of the CD-Rom, there are three women standing above and over to the right of Nana. Who are they? They are obviously McDonoughs' or in-laws. 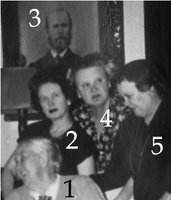 Attached is a photo - circa 1939 - where the woman holding me could be the same person at the extreme right on the CD-Rom. Am I correct? Then who is she and who is the young lad with her who is obviously her son? Here is the photo Rae mentions from the cover of the CD-ROM handed out at the Sept. 7th Gathering. 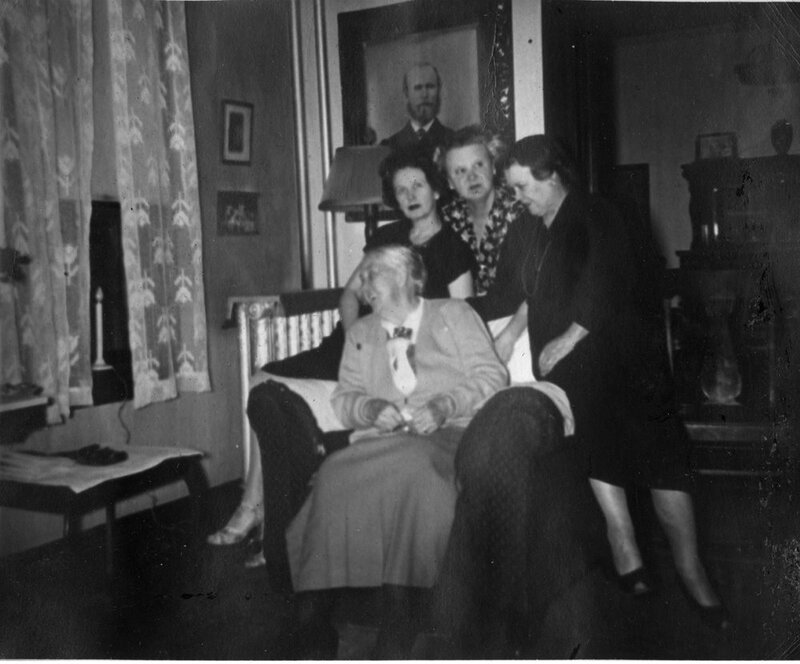 The photo is from my Grandmother, Grace McDonough Deedy's, photo album and was taken inside 1 View Street. If you can help with the identification, please leave a comment or send me an email. As always, Thank you for your help! 0 Comments Published by Jane on Tuesday, September 16, 2008 at 5:37 PM. I have been hard at work trying to untangle the various Loftus connections to see if I can verify all of Mary Loftus McDonough's relatives who immigrated to Worcester, MA. From family stories, I had heard that Mary Loftus McDonough's parents resided in Worcester with her or near her when they were quite old. The story went that Mary helped support her parents toward the end. In the 1900 Census I saw that Mary's Father, Patrick Loftus was living with her - so this supported the family story. I continued to search for Loftus relatives in Worcester, but realized that the name is not very unique. To aid in my identifying Loftus relatives I paid particular attention to addresses. Mary Loftus McDonough owned a number of properties around Worcester and made a habit of renting to her relatives. 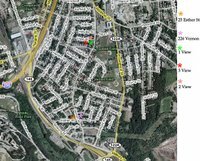 In the above map, I have marked the properties I believe Mary Loftus McDonough owned (click on image to view larger). Knowing these addresses has helped me confirm that yes, Mary Loftus McDonough helped support her parents in their later years. As you will read below, her Mother (Mary Morley Loftus) and Father (Patrick Loftus) were living at 25 Esther Street in 1899 when Mary Morley Loftus passed away. By 1900 we know Patrick Loftus was living with Mary Loftus McDonough at 1 View Street. In 1903, Patrick Loftus was waked at 226 Vernon Street where his daughter, Winnifred Loftus Murphy was living. LOFTUS -- In this city, July 23 , Mrs. Mary (Morley), wife of Patrick Loftus. Funeral from her home, 25 Esther street, Tuesday morning at 8:15. Requiem high mass at the Sacred Heart church at 9 o'clock. Friends and relatives are invited to attend. LOFTUS -- In this city, Dec. 9 , Patrick Loftus, Funeral from the home of his daughter, Mrs. Martin Murphy, 226 Vernon street, Friday morning at 8:15 o'clock. Solemn requiem high mass in Sacred Heart church at 9 o'clock. Relatives and friends are invited to attend, and kindly requested not to send flowers. Now, Patrick Loftus death record is a bit confusing. I believe the son, young Patrick Loftus, was confused when asked for the information. Perhaps he thought they were asking for his Father and Mother's name. The other theory is young Patrick simply did not know the information and just gave his information. Another thing to note with this information is the ages listed for both Mary Morley Loftus and Patrick Loftus at death. I believe these ages are incorrect. Patrick Loftus was listed as 70 yrs old in the 1900 census - which would mean he was 73 yrs old at death, not 64 (the age young Patrick likely provided - do you see why I don't trust young Patrick's information?) Mary Morley Loftus age of 57 seems far too young. However, I believe her parents names are listed correctly. The death record does not say who provided the information, but likely it was her husband Patrick Loftus, since he would have been alive in 1899. More to come as I continue to try to untangle these Loftus connections! 0 Comments Published by Jane on Sunday, September 14, 2008 at 1:59 PM. 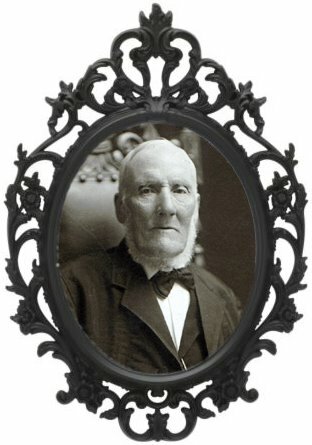 William Austin was born in December of 1819 somewhere in England. At some point he emigrated from England to Canada. According to the 1900 Census, he immigrated in 1868 from Canada to the U.S. and became a naturalized citizen. I will need to search for his naturalization documentation at some future point. It may pinpoint just where in England he was born. William lists his occupation as either laborer or "porter in store" in various census reports. I assume his occupations paid modestly. Yet, by the 1900 census he indicates that he owns his home free of a mortgage (81 Saratoga Street, East Boston, MA). 0 Comments Published by Jane on Saturday, September 13, 2008 at 2:55 PM. Jack Barry is seen and mentioned in Baseball - A Film By Ken Burns . Below is a clip from the 3rd Inning - toward the end you will see Jack Barry with the other members of the $100,000 infield. 3 Comments Published by Jane on Friday, September 12, 2008 at 6:57 AM. 0 Comments Published by Jane on Wednesday, September 10, 2008 at 5:35 PM. Before the main event at the DCU Center, a group gathered at St. John's Cemetery to view the various family graves. The tour was lead by my Father, Tom Deedy who was assisted by my Niece, Priscilla Briggs. You can view photos of the tour by clicking here. 0 Comments Published by Jane on Monday, September 08, 2008 at 6:15 PM. The September 7, 2008 Gathering of the McDonough's and Deedy's was a great success! I had a wonderful time meeting everyone. In fact I had too good of a time and forgot to take any pictures! Skip Roosevelt was kind enough to send me some of the photos he took of the day. But if others seeing this note have pictures please send them to me and I will add them to the 2008 Gathering Gallery. Update: Patty also sent me more photos which arrived today - Thank you Patty! During the event we had six wonderful presentations. Many have asked for copies. Here are four of the six for you to read. I will work on getting the other two and post them once they are available. 1 Comments Published by Jane on Tuesday, September 02, 2008 at 8:39 PM. The final details with the DCU Center were completed today. 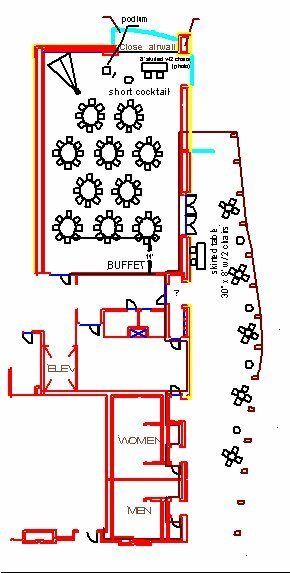 Here is the diagram (click on image to view larger) of the new larger Jr. Ballroom where we will be meeting. You will notice that we have ten tables with eight seats each. There will be no assigned seating and I hope people will be moving around a lot and table hop as we mingle (well, maybe not during the presentations!). Just outside the room is a long/large hallway where smaller tables will be set-up. This will give people a chance to step outside the larger room to mingle in smaller groups (I am not sure how loud the main space will get). So we have lots of room to spread out. A couple of weeks ago I posted a cemetery map and instructed you to print it out. Well, additional graves have been brought to my attention. Here is the updated cemetery map. Please print this new version out and bring it with you!